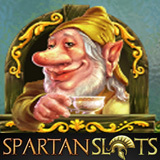 There's a brand new game with a Irish mythology and folklore theme called Dwarven Gold at Spartan Slots. You can claim a bonus up to $400 to try the new game from Topgame by entering bonus coupon code DWARVEN GOLD when you deposit. Spartan Slots is a deluxe online casino offering over 150 games from Topgame. Its most popular games include Monster Madness, Dice & Fire, and Sugar Rush. If you're a new player you'll be welcomed to the casino with up to $5000 in casino bonuses added to your first six deposits. Dwarves Nibbles, Gibbles, Fillydook and Fenthwick spin on the reel of the 25 pay line Dwarven Gold. You can bet as little as a penny or up to $5 per line for a max bet of $125. A Black Cat is the Wild symbol and the Scatter is a Butterfly. Three or more Butterflies trigger the bonus round where there are up to 33 free spins and a 6x multiplier waiting to be won. After any winning spin you can play the Gamble feature and double your win by guessing whether the next rune will be red or black.